Oil painting by Anton Raphael Mengs (1728-79). Photograph: Bridgeman Art Library. 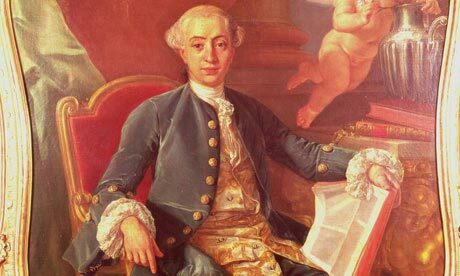 This project will make an attempt to demonstrate the way of life in 18th century Venice through the life and times of the notorious Giacomo Casanova. Casanova (2 April 1725 – 4 June 1798) was a famous 18th-century Italian adventurer and author from the Republic of Venice. Although at the time Venice was not anymore the formidable naval and political power of the Mediterranean, as it used to be from 12th to 15th century, it witnessed an unprecedented florescence in culture and arts. This prosperity was cultivated during Renaissance and up until 1797, when Napoleon conquered the city, bringing it to an end. 18th century Venice was at its full prime, exercising significant influence on arts, architecture, literature and fashion, thus attracting many young noblemen and artists throughout Europe. This exciting environment is exactly what we will try to capture in this project : the popular places of the time, the favorite forms of entertainment (especially among the high society), the social structure of the city, the cultural elements that made it unique and generally how it must have felt like to live in Venice of that epoch, experiencing all the fascinating possibilities this great city had to offer. Manual or semi-automatic extraction of data relative to the various places, buildings, social events and important characters mentioned and described in the used references. Description of the social and cultural environment of the 18th century Venice and Europe in general. Information retrieval about the dominant trends, customs and the everyday life of ordinary and/or privileged citizens of the city. A pleasant visual representation of the findings. First, we introduce our main source of information. More than 80% of the project work will be based on the famous autobiography and simultaneously memoirs of Casanova, entitled “Histoire de ma vie” (English translation: Story of my life), which covers the biggest part of his life, up to 1774. Casanova himself wrote his memoirs, starting in 1789, during a period of isolation and idleness. Despite his Italian origin, the manuscript is written in French, the common literary language of the time, under the pseudonym Jacques Casanova de Seingalt. The first publication of the book consisted of a mediocre translation in German of the largest part of the manuscript and took place long after his death. Another famous adaptation, in French this time, was made by Laforgue in 1831, but the original text was heavily censored and ‘edited’. All later copies and translations until 1960, including the most known English translation by Arthur Machen, are based on these first two editions. Finally, the first complete, authentic and uncensored edition of the text was published in 1962 through collaboration of the Brockhaus Publishing House, owner of the manuscript, with the French editor Plon. The English translation based on the Brockhaus – Plon reference was made by Willard R. Trask around 1970. The original version of the book includes 12 volumes of approximately 3500 pages in total. The version that is going to be used for this project , at least for the moment, is the free online edition of The Project Gutenberg, which is actually the Arthur Machen’s edition, constantly revised till today, containing also the additions and corrections made by Arthur Symons in the early 1900s(around 4000 pages). Effort will be made to find a free or cheap edition of the more original and accurate Trask translation. First goal of the project is to actually read the book and extract the valuable information relative to the project’s purpose. Because of the vast extent of the text and the limited available workforce (only one person for the moment – others might join next semester) the main research work will focus on the chapters relevant to Casanova’s life in Venice. Casanova spent his childhood and adolescence between Venice and Padua, where he attended Padua’s university from age 12 to 17. With some small breaks as a scribe in the service of a cardinal in Rome and a very short military career in Corfu, he stayed in Venice until the age of 25, when he decided to undertake the so called Grand Tour, a famous journey across various important European cities, popular among young noblemen of that time. Grand Tour also included Venice as one of its main stops, so there is good potential in learning interesting details about this custom which was closely related with the city itself. Casanova returned to Venice after three years, in 1753, where his scandalous lifestyle and provocative beliefs and manners led him to prison two years after. He managed to escape dramatically to Paris in 1757, while the next 13 years was on the run, from country to country, all over Europe. He finally got accepted back to Venice by the authorities in 1774, after long and careful preparations towards this purpose. He stayed in his birth city for the next 9 years, only to leave again in 1783, this time for good. The corresponding parts of the Gutenberg book are volumes 1, 4, 7, 8, 9, 10 and 30. Another interesting source of information except from Casanova’s memoirs is the book by acclaimed historian Ian Kelly entitled “Casanova: Actor, Lover, Priest, Spy”. In this book, Kelly makes use of unpublished documents from the Venetian Inquisition, and documents by Casanova and his friends and lovers, which shed light on unknown sides of his life and character. Popular and important places in Casanova’s course like Venice and Paris, come to life through Ian’s pages. Finally , many comics, series and books are inspired by Casanova’s life and after careful consideration could be identified as possible references and sources of easier and more vivid rendering of the various events, characters and places. A quite famous movie that could be examined is Federico Fellini’s Casanova. After having found and decided upon which elements we are going to concentrate on, we could start creating a database with all the important people, social events, popular places and habits mentioned in our sources. To this end, a spreadsheet program or more sophisticated tools like SQL or RSQL could be used. Casanova maintained a very vibrant social life, including love affairs with dozens of ordinary and highly regarded women, numerous friendships and acquaintances with important persons like state officials, princes, religious leaders, artists, thinkers etc. and of course many examples of powerful enemies giving him a hard time or hindering his ambitious plans. All these important relations should be pointed out and registered. Considering the data presentation there are a couple of ideas on the table, which could be implemented solely or cumulatively, to produce a better result. Create a visual version of the database with images (when available) of the different Venetian buildings, places, events, customs or persons that influenced Casanova’s life or were occured frequently in his everyday routine. Notable 18th century Venetian buildings like the Palazzo Malipiero (where Casanova spent a couple of years of his youth) or famous customs, like the Venice Carnival, can be illustrated and briefly described through Casanova’s unique perspective. The actual way of representation is not yet determined and remains subject to discussion and mutual agreement with the assigned TA. Because the project’s theme is quite vague and creative, there is a certain amount of freedom on what data will be chosen for presentation and the way they will actually be presented. Another option, quite related to the previous point, is integration of some types of Data Driven Documents in the project’s blogpost, available on d3js.org, most of them ready for implementation. For example, interactive graphs could be introduced to present the complex associations between the numerous acquaintances of Casanova. Data driven documents provide an easy way to manipulate large datasets in a dynamic and animated way. Lastly, the 3rd option is a more artistic approach to our subject. 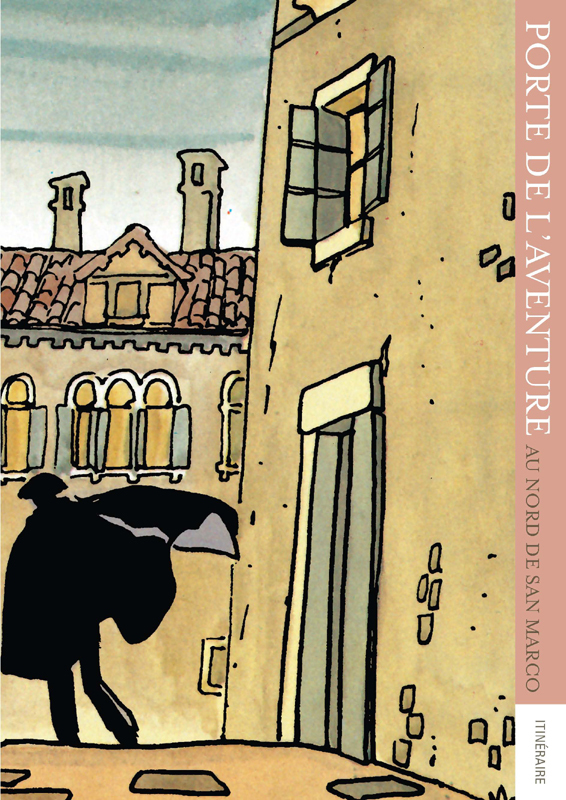 The idea is to create a comic-based, Corto Maltese’s style adaptation of a selected part of the memoirs, relevant to Casanova’s life in Venice. The expected result should be the narration of a story, illustrated with images, small texts and dialogues, giving interesting insights in the different elements we want to highlight from the main character’s life inside the city. 09.03.2013 : Search for additional references (books, documents, movies). Try to find the complete and original version of the memoirs based on the translation by W.R. Trask . 13.04.2013: Read all relevant sources and highlight the important features we are interested in. 04.05.2013: Construct the necessary database with all the places, events and characters that we picked to concentrate our efforts on, including possible relations and interconnections between them. 25.05.2013: implement the visualisations. Produce the final data presentation according to one or more of the ideas cited above. The Memoirs of Jacques Casanova de Seingalt. Arthur Machen complete translation of the censored Laforgue text. Regularly reedited, including the revised Arthur Symons translation, in 1902, then in 1940. Casanova: Actor Lover Priest Spy.